Chason, Rosner, Leary & Marshall was a proud sponsor of the 2018 Magic of Life Gala in support of LifeBridge Health (Sinai Hospital, Northwest Hospital, Carroll Hospital, Levindale Hebrew Geriatric Center and Hospital) and its crucial programs that benefit patient care, programs, and services. Raymond L. Marshall was elected to the Board of Directors for the ARC of Maryland on January 21, 2016. The Arc Maryland is the largest and strongest statewide advocacy organization advocating on behalf of and with persons with intellectual and developmental disabilities and their families in Maryland. Chason, Rosner, Leary & Marshall, along with patients, friends and employees of the University of Maryland Medical Center, became a proud sponsor of Camp Open Arms, a camp for children with limb differences such as brachial plexus birth palsy and congenital/traumatic deformities. Campers ranging in age from 4 to 9 attended the two fun-filled days in Monkton, Maryland. Chason, Rosner, Leary & Marshall, was a proud sponsor of the 2015 Upper Chesapeake Health Foundation’s Cruise for a Cause to benefit Cancer LifeNet which was held on September 26, 2015 in Havre de Grace, Maryland. Raymond L. Marshall and paralegal Jackie Mangiantini recently participated in “Pro Bono Day” at The Community College of Baltimore County, Essex campus, in partnership with Maryland Legal Aid. The purpose of the event, held once a semester by the college, is to provide free legal advice to those who cannot afford counsel in various areas of law, including family law, housing, expungement, estates and wills, and bankruptcy. Chason, Rosner, Leary & Marshall was a proud sponsor of Habitat for Humanity Susquehanna’s 13th Annual Dream Builders’ Ball on February 21, 2015. Habitat Susquehanna has been helping Harford and Cecil county families since 1993 and has served over 250 families through homeownership and repair programs. 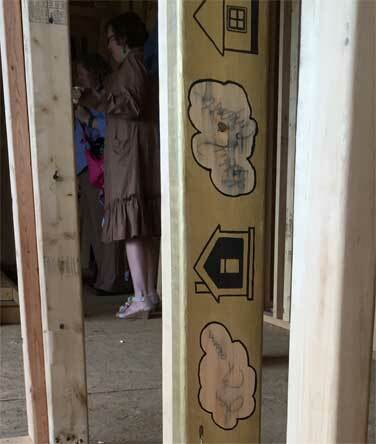 In addition to being a proud sponsor of the Dream Builder’s Ball, the partners and employees of Chason, Rosner, Leary, & Marshall, LLC decorated a 2 x 4 stud which was used in the building of a Habitat House. This is a picture of the stud actually being placed during the building process. 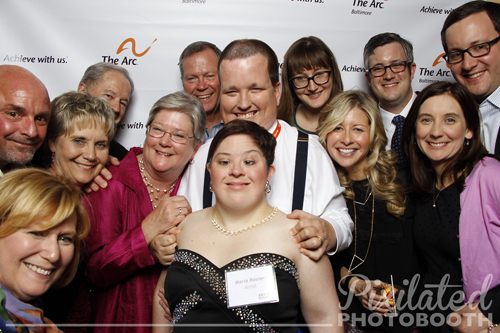 On November 7, 2014, Chason, Rosner, Leary & Marshall was proud to sponsor the Arc Baltimore's annual Art in the Round, where the talent and artistry of individuals with disabilities is showcased. Erika Alsid Short, a Member of the firm, was on the event planning committee. Dedicated to providing advocacy and high quality, life-changing supports since 1949 in Baltimore City and Baltimore County, the Arc Baltimore supports more than 6,000 adults and children with intellectual and developmental disabilities and their families. Raymond L. Marshall spoke at the Arden Courts Skilled Nursing Home to residents concerning the role of lawyers in today’s society and the different functions of government to dementia patients. Chason, Rosner, Leary & Marshall, LLC contributed to the Maryland Disability Law Center relocating to Union Mill as a capital campaign partner in 2012. In the Summer and Fall of 2011, Raymond L. Marshall, in a pro bono capacity, successfully prosecuted three appeals against the Maryland Department of Health and Mental Hygiene for the denial of medical equipment to disabled children. Chason, Rosner, Leary & Marshall LLC has been selected as the 2010 recipient of the Baltimore County Bar Association's Annual Pro Bono Firm Award. An award reception honoring all recipients was held on October 28, 2010 at the law firm of Hodes, Pessin & Katz, P.A. Click here to read the article featured in Maryland’s Daily Record. (Towson Law Firm Encourages Pro Bono Work, D. Jacobs, November 21, 2010). Attorneys and staff of Chason, Rosner, Leary & Marshall LLC participated in the St. John Foundation Baltimore Crossroads@95 5K Cross-Country Challenge in support of the Baltimore County Police Athletic League ("PAL"). Erika Alsid Short is a member of the PAL Board of Directors. Baltimore County PAL is a non-profit organization that provides a safe, constructive alternative to youth with the positive goals of preventing juvenile crime, reducing juvenile recidivism and increasing community partnership. Raymond L. Marshall was awarded the “James F. Rosner Award for Advocacy” by the ARC of Baltimore at their Annual Meeting and Awards Ceremony on May 7, 2008. This award recognizes a law student, social work student or attorney who has demonstrated remarkable commitment and pro bono services on behalf of persons with developmental disabilities. For the fourth consecutive year, Ray also received a Pro Bono Service Appreciation Award from ARC of Baltimore. James F. Rosner (retired 1/1/16) was also awarded a Pro Bono Service Appreciation Award from the ARC of Baltimore at their Annual Meeting and Awards Ceremony on May 7, 2008. The award is presented to attorneys who give their time and expertise on behalf of ARC-supported individuals with developmental disabilities. This is the 15th consecutive year that Jim has received this award. Erika Alsid Short argued before the highest court in Maryland, the Court of Appeals, on behalf of a death row inmate, Jody Lee Miles, regarding a constitutional challenge to the sentencing portion of the Maryland death penalty statute. Erika, who was appointed by the United States District Court for the District of Maryland to work on the case, along with lead counsel, Robert Biddle, argued that, under the 2007 Supreme Court opinion, Cunningham v. California, the weighing of aggravating and mitigating factors should be conducted by a jury based on a "beyond a reasonable doubt" standard, and not under the current standard of merely "a preponderance of the evidence".